When is the last time you were told “satisfaction is not guaranteed“? Probably never! 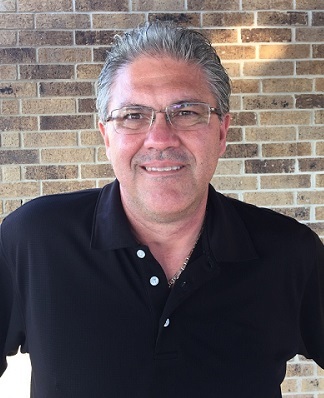 However, if you are looking at Austin patio ideas and are thinking about getting your existing patio stained, we ask you to give some more thought to that before you proceed. Archadeck of Austin can offer a better solution. Perhaps you have wanted to give your old patio new life and considered staining to be like a face lift for concrete. You may have seen a neighbor’s patio that was stained, and maybe they were thrilled with it. We want to caution you about expecting the same results at your home. There is just no way of knowing how staining will turn out. Here is the truth: Staining concrete is so unpredictable that we ask our clients to sign a disclaimer before we will stain their concrete surfaces. The best thing about staining is the price. It is the most affordable option if you simply want a new look for your patio. But is it worth the risk? We have stained patios with mixed results — and it’s not just us. We don’t want to get too technical here, but the most important factor is the condition of the concrete. How porous is the surface? And is that porosity uniform across the entire surface? Does the patio show any (unintentional) stains, maybe from fruit punch spilled during a long-ago birthday party? Keep in mind that while stain adds color to concrete, it does not cover up markings already there. Stain does not cover a surface the way paint does; it permeates the concrete. If a concrete sealer was applied to your patio in years past, that sealer will affect the results of staining today. How well was the concrete cured, originally, and was it cured uniformly? Was a curing membrane applied to the concrete? There may be a lot you don’t know about that patio you see every day. Inconsistent sealing or curing, no matter how long ago, will lead to inconsistent results when the patio is stained. 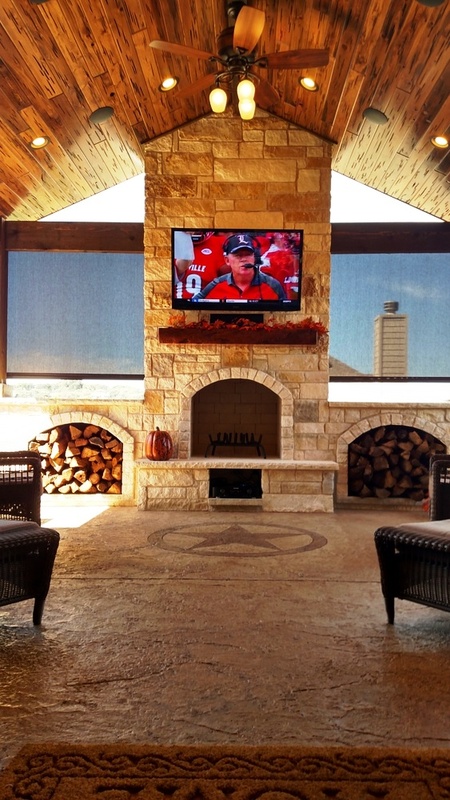 Austin covered patio with custom overlayment. 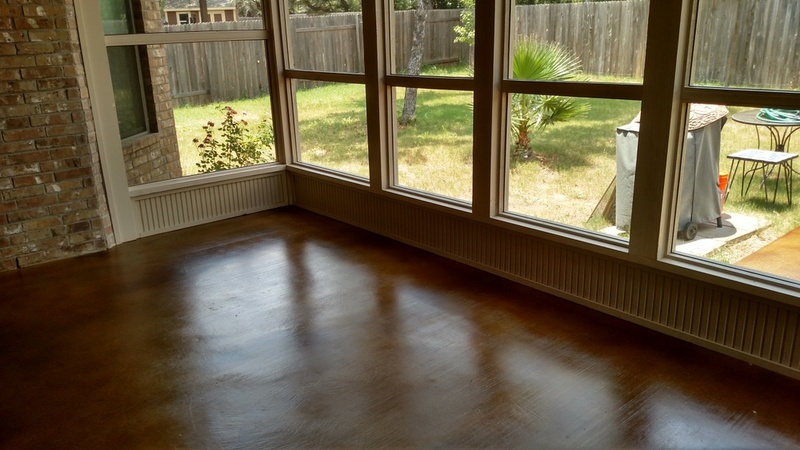 Archadeck of Austin recommends resurfacing, also called concrete overlay, instead of staining a patio to give it new life. We can show you exactly how it will turn out. If its surface is even and has no large cracks, your patio is a good candidate for resurfacing. We will apply a concrete overlay, a cement-like material that we spray or spread over your patio to give it a new surface. Even better, you can select a decorative finish for your patio such as the look and texture of stone. We can achieve the look of stone by stenciling or stamping the overlay after it’s applied. We can show you a wide range of textures and colors for your “new” patio. You can even request a slip-resistant surface if that feature is important to you! What’s more, we recommend installing the concrete overlay near a pool, if you have one, because the new surface is less likely to be damaged by pool chemicals or exposure to the sun’s ultraviolet rays. In a hurry? Many concrete overlay products dry quickly. Don’t wait to call us! 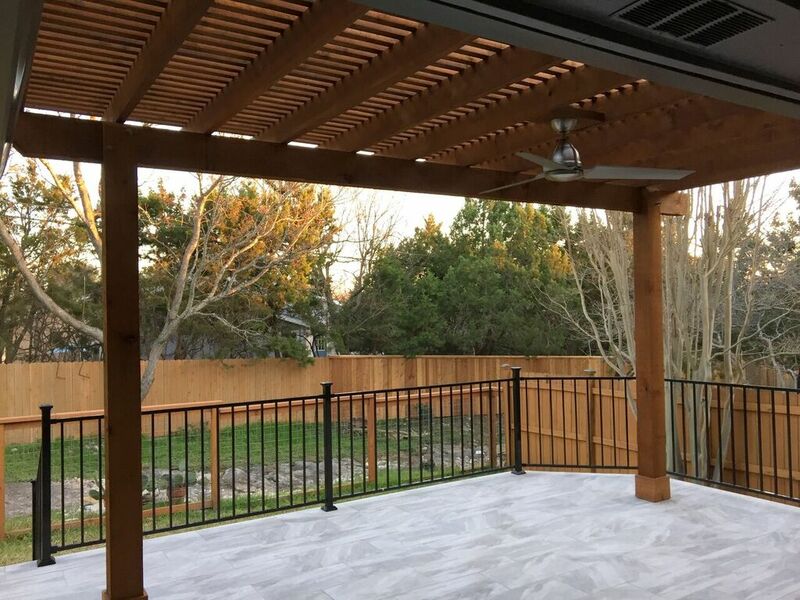 If you would like to learn more about updating your patio without having to remove it and start over, contact Archadeck of Austin today at (512) 259-8282 or via email at jim.odom@archadeck.net to schedule a free design consultation. This entry was posted on April 14, 2017 by austinporchandpatio. It was filed under Archadeck of Austin, Austin patio cover, Covered Patios, Patios, Patios and Hardscapes and was tagged with Archadeck of Austin, Austin patio builder, Austin patios, Brushy Creek TX patio builder, Cedar Park Patuo Builder, Georgetown TX Patio Builder, North Austin Patio Builder, Patio Builder Near Me, Round Rock Patio Builder, South Austin Patio Builder, Steiner Ranch Patio builder, Unique patio designs Austin TX.